Highways England is ramping up its campaign on the dangers of tailgating with the help of professional racing driver and Hollywood stunt expert Ben Collins, best known for his role as the former TopGear ‘Stig’. Although on-the-spot penalties were introduced in August 2013 – meaning police officers can issue £100 fines and three points for drivers spotted tailgating or lane hogging rather than taking them to court – nearly nine out of 10 (87%) people say they have either been tailgated or seen it. And at least a quarter (25%) of drivers admit to tailgating. Yet statistics show that one in eight of all road casualties are caused by people who drive too close to the vehicle in front, with more than 100 people killed or seriously injured each year. And tailgating was the third most common contributory factor in deaths and serious injuries on UK motorways in 2016. 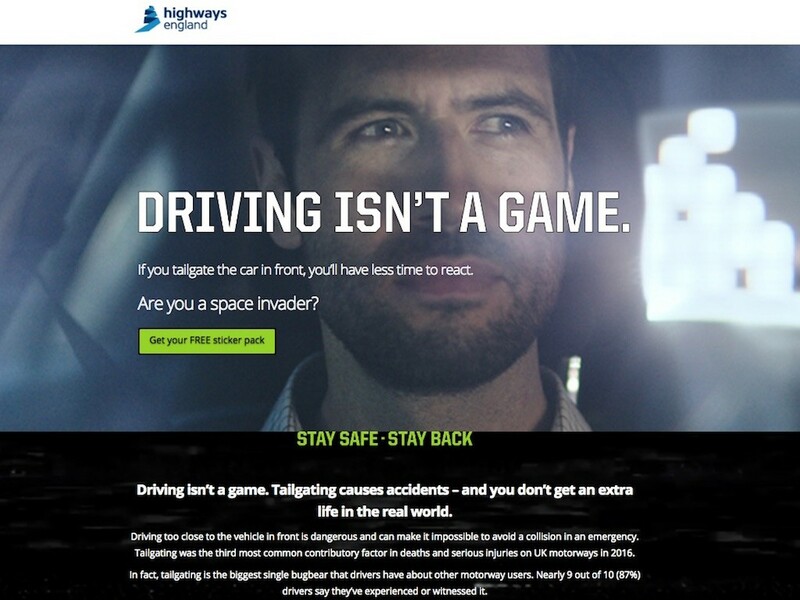 Last September, Highways England launched a campaign featuring the well-known Space Invader video game character to alert drivers to the anti-social nature and risks of tailgating. Richard Leonard, Head of Road Safety at Highways England, said: “It’s great to have someone of Ben’s experience backing the campaign and the message today is really simple around tailgating. A host of companies have already backed the ‘stay safe, stay back’ campaign, including National Express, which is carrying the message on some of its long-distance coaches. Other advocates include the RAC, National Police Chiefs Council, Brake and the Institute for Advanced Motorists, and Thatcham. Highways England has a dedicated webpage where drivers can find more information about tailgating and what they can do to stay safe.